The attitudes and concerns of investors regarding the economy and their own personal challenges are analyzed in this report. What are wealthy investors worried about? How do these concerns impact their financial decisions/ This report provides financial institutions and advisors with reviews on investor's thoughts on retirement planning, health care, and other personal concerns, which will, in turn, help them more effectively meet the needs of these investors. 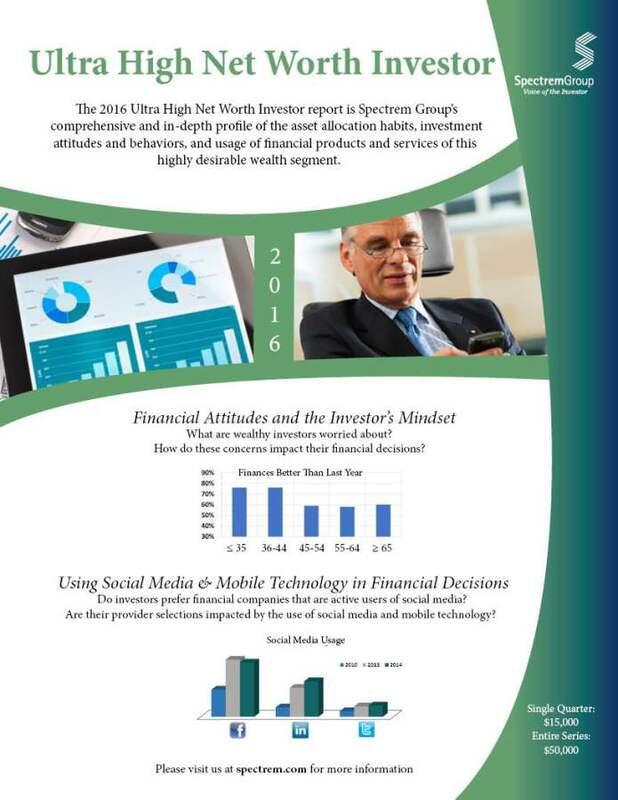 Use of social media and mobile technology is continuing to increase and is constantly changing the way investors gather their financial information and perform various financial transactions. Do investors prefer financial companies that are active users of social media? Are their provider selections impacted by the use, or lack thereof, of social media and mobile technology? This report examines the use of today's most popular social media platforms and mobile technology capabilities and outlines how investors would like to use social media in their relationships with their providers and advisors. An investor's relationship with his or her advisor is constantly changing. What types of planning do investors expect from their advisor-retirement planning, long-term care, estate planning? Advice needed and expected from today's investors is very different than years past. This report examines an investor's expectations of advisors - on everything from communication expected to advice they are seeking. This report examines the portfolios of wealthy investors. How do they have their assets allocated? Are they primarily invested in mutual funds, real estate or other types of securities? What are their perceptions of primary providers in the industry and whom do they use as their primary provider? Insights from this report will allow providers and advisors to understand how they are perceived among investors and will help them identify products, services and future branding strategies they can take to ensure client satisfaction.